I think my interviews went quite well. None of the interviewers were really drilling me. More like a friendly discussion of my research, prodding me into how I think, my view on things, etc. I felt quite comfortable in the interviews. It helped that I had met all of them before (except one, but I had stared at his picture so much that I feel that I know him) and generally knew about their work. The stressful thing was getting hold of people. It snowed a few days ago and it has been cold enough here that it didn't melt. Some small streets and parking lots are pretty icy, but the main thoroughfares are fine. Regardless, people here freak out with the sight of snow and stayed home. This is the second day in a row that schools were closed. Microsoft is open, but with limited services, i.e. not all building lobbies have a receptionist and the cafeterias are closed. The recruiter that I was originally supposed to meet didn't come to work, so I had a replacement, but she didn't show up either, and I had a 3rd as a fill-in. One of my interviewers didn't come into work either, and I'm not sure what's going to happen there. I am here for the next week, so I can come back to do the interviews if necessary. I'm no longer at school and now I work at Panera Bread. First snow sighting this season and it's in Seattle of all places. I was told that it doesn't snow here. It snowed quite a bit esp. in Redmond and it was just a mess. People here freak out with snow. There was some hail today as well. Weird weather. Still skies, and then all of a sudden downpour of snow, and then it stops. Then it hails, then it flurries, and then it stops. It was good for snowboarding Sunday though. Went to Stevens Pass with Alex, Stacey, and Deepak. Funny thing was the last time I went snowboarding was at Stevens Pass with Alex and Stacey back in March. That was their last time too. The chains on the car tires was fun, esp. when the chains starting ripping off. Snowboarding was pretty good. Tons of snow. Lots of powder. A bit on the cold side though. I was being pretty careful b/c I was a little concerned about my knee, so no moguls for me this time. I might get a knee brace to go snowboarding as a preventative measure. I'm not a huge Stevens fan b/c it gets very moguly. I don't like moguls. I fall in moguls and I'm pretty sure that repeated falling for 6 hours of snowboarding last time at Stevens is what caused me knee pains for like 6 months, though volleyball didn't help. Oh, I got my luggage just before 1 am the night I landed. I also forgot some key things: camera, maps, and snowboard lock (though we didn't really stop b/c we got there late, like noon, and so we just kept going until it closed at 4). Gonna go to Microsoft Research again tomorrow to work on my paper. Have to leave by 8 to move stupid car. Sarah loves that I was at MS longer than she was today. I'm so tired. It's 12:17 am, meaning that it's 3:17 am Toronto time. I only had an hour to get to my connection flight in Denver. I made it and had McDonald's lunch to boot. My luggage didn't make the connection. So, I'm sitting here in Sarah's apartment waiting for my luggage to be delivered. It's supposed to get here before 1 am. It wouldn't be too bad except for the fact that one of the pieces is my snowboard and I'm going snowboarding tomorrow!!! Oh, and all my winter clothing is in my suitcase. Existence requires you to actively push your presence upon me and constantly remind me of your existence and your doings and provides me with an easy and non-intrusive way to contact you. Maybe you cause a little pop-up on my screen when you come online in IM and you say something about what's going on in your name or status message, or your new blog post shows up in my Google Reader, or I get an e-mail saying that someone commented on my blog, or I see that you have had activity in Facebook. On a related note, stalking people is very important. Everyone spies and stalks people online. No need to hide it. Everybody does it. And I don't mean "Googling" people and checking out their "homepages". That's so 2003. No. The epitome of stalking in 2006 is finding someone on Facebook when all you have to go off of is their first name, and you can't even spell it properly. Once you found them on Facebook, you have an immense amount of info at your disposal - contact info, life ambitions, interests, baby pictures, drunken pictures to bribe them with, and their popularity factor (how many "friends" they have :p). You can also try and find their blog (no one has a homepage anymore) or look for them on other social networking sites. Apparently Winnipeggers love Hi5. If a Winnipegger is on just 1 social networking site, it's Hi5 for some reason, despite the fact that it's garbage. This is all "innocent" stalking.... people just wanna know more about other people. I had like 50 people at fellowship today comment about things on my Facebook and blog: "I didn't know you were doing a PhD! ", "I read your post about 'Bible Study'", "Oh right, you were the guy with the flower in your hair", "You worked at Google and Microsoft?". I don't mind people spying / stalking me. I wouldn't put that info out there otherwise. Go ahead, stalk me! Just know that I reverse stalk you. You stalk me, I stalk you back. Rostecki, you can stop with the silly "the-cloak.com", it doesn't work, and upgrade to Firefox 2.0 already. Had a conversation with a friend about money, b/c my credit card bill was $980 this month, and that's without having a girlfriend to pay for! Not sure what my typical bill is, but it's probably closer to $200ish, but the inflated amount is due to my recent discovery of shopping as well as buying concert tickets. Oh, and then my other credit card was like $750, but Mommy and Daddy pay for that one (groceries and other necessities as well as my flight back to Winnipeg for the holidays). They want to pay for it, so who am I to say no? They also pay my tuition and housing. My parents figure that they continue to pay for my older sister's housing, since she still lives at home, so then they pay for mine. I guess they want to provide for me as long as I'm still in school, despite the fact that I can support myself. This brings me to a conversation I had with a different friend, asking me what to do with extra money that he had. I obviously don't just keep my savings in a bank account. That would be dumb. Most of my money is in GICs (guaranteed investment certificates, called a certificate of deposit, or CD, in the US) and mutual funds. A GIC is like giving a loan to a bank. They take your money for a specified period of time and they give you interest (4, maybe 5%), higher than what a savings account would give you. The interest rate is fixed before hand and is "guaranteed". That's the safest investment. If you need the money before the time is up, you can often get it, but pay a penalty, eg. no interest, or very low interest. There's this strategy called laddering, where you split your money up and invest it in spaced out GICs so that one of the GICs matures each year and then you reinvest for a long time period for the best interest rate, but still get the advantage that some money matures each year if you want, but more importantly, it mitigates fluctuations in interest rates (they change). It doesn't take much to get a GIC, some places, like PC, I don't think there's a minimum amount, and others it would be like $500 or $1000. It's a good idea that if you know you have a bit of money that you don't need for a year, to at least put it in a GIC. Bonds are also talked about a lot, but I don't do much of this directly. Most of my investment in bonds is indirectly through mutual funds, though I have one Canada Savings Bond. So, they say that for someone around my age, that I should have something like 60% in mutual funds and then the rest in bonds, GICs, and saving accounts. I don't have this ratio yet, but with my constant investment in mutual funds, it is slowly getting there. One other class of investment that I've been looking into recently and is really interesting from a social and economic perspective and has the potential to flip the whole banking industry on its head is person-to-person loans. Banks make money by taking your money and lending it out to others. They charge others interest for the loan, and they pay you a little bit of interest for your savings account. The rest they keep for profit and to make up for loans that are not paid off. This person-to-person loan thing is a means to directly loan money to people, cutting out the bank as a middle man. The idea is that borrowers get a better rate than from the bank, and lenders get more interest than from the bank. Prosper is a site that does just this. It's like Ebay for loans. Borrowers post that they want to borrow money. Lenders then auction to supply money to the borrower. It's a pretty sophisticated site and it's legit (they gave a talk at Google when I was there). They do the same credit checks that a bank does and if you default on a loan, it pays the same penalty as if you default on a bank loan. It's cool to read the stories people have for the reason they need money, their current financial situation, etc. The strategy here is like with anything else. Diversify. Don't give all your money to one person b/c if he/she defaults on the loan, you are screwed. The site has an automated system where you can tell it to spread you money out across people that have a certain credit level, a minimum interest rate, and several other factors. There are risks. People will default on their loans. The site has stats to tell you how often people of certain credit level default, etc. And you adjust your interest rate accordingly, eg. if you assume that 1% of people with a B credit level default, and you want an interest rate of 12%, then you only lend out if you can get 13% interest. I take it from a completely objective view. I use the automated system to determine where my money goes and I give just the minimum amount to each person ($50). I do like to read the stories of the loans that I am investing in. I lend money to a girl who works for a photo production company in Miami and wants to consolidate her credit card debt. I'm also helping a guy buy an engagement ring (good luck! <-- not said in a sarcastic tone). Sure beats looking at numbers and watching if the ticker goes up or down. I think it's a fascinating idea and I'm just trying it out with a bit of money right now to see how it goes. It's only for the States though. I managed to get an account b/c of my US bank accounts. One motivating factor for me is that I don't have any mutual funds for my US savings. I'm just starting to get some CDs, but it's not that easy, at least with the banks I'm with. Unlike in Canada, where you can do it online very easily at most banks without any physical paper work. I looked into getting mutual funds, but it was a bit of a headache to get it started and I didn't like how they charged you for it. Next time I find myself in the States, I will open up an ING account and get their mutual funds, as they seem to work the same way as the ones for the Canadian version of ING. Ya, so without any investments with risk, I decided to look into this person-to-person investing. My aim with this is to get at least 12% interest, which is way better than GICs (5% at best). So far I'm +$0.85!!! But it's only been maybe 2 weeks. Anyways, save as much as you can and make it "work for you". Start small and work your way up as you become more knowledgeable in investments. Diversify. Max out your RRSP contributions (or 401K in the US). Pay off your credit cards fully each month (the interest on cards are retarded). Get a card that gives you rewards (mine from Citibank gives me 1% back in cash). Ya, so that's my money rant. Do not take any of this as investment advice. Consult your financial advisor before making any financial decisions. Leave your mark. Vandalize my blog. Create chaos! The old blog wall was broken b/c the site that was hosting the code for it was down. It did the job, but I wasn't totally happy with it. 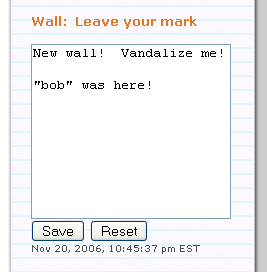 The new version looks nicer, has an undo/refresh button, and shows you the last time the wall was updated. Searching around, I couldn't find anything else on the Internet that was a suitable replacement. So, I coded it up myself! It took me a few hours and it was pretty straight forward. I even managed to create a Google Gadget and put it on my personalized homepage :), though I didn't make it public. I'm hosting it on my school's web server and all I used was a form and some PHP code. It's not every day that you can say that you learnt a new language! PHP is actually a really easy language and had very few surprises/quirks. Add in some html forms, a bit of css, some xml (for the gadget), and there you have it! Don't be fooled by the "2.0" in its name, it's not Web 2.0 (yet). Ok, well, parts of it are in that it's collaborative and it brings about interaction with the visitors and between visitors, but the underlying technology is very Web 1.0. The old version saved it as you typed, but now you have to hit the "Save" button. I think the existence of the save button is good in that it will prevent accidental modifications by people just curious with it and decide to say, delete everything. This would be a good chance for me to play around with AJAX if you guys want the "auto-save" / "save as you type" feature. Might have some issues though if multiple people are editing it at the same time, though there are issues with the current implementation as well (the last person to save overrides even if it was based on an older version of the wall). My family always asks me and my sisters to make Christmas/Birthday lists to make gift shopping easier. Traditionally, we write on pieces of paper, maybe taping on clippings from flyers, and then put it on the fridge. Additions and modifications would be made as necessary. Sometimes the list would go missing when it was taken to go shopping and never returned to the fridge for the benefit of others and rarely returned to the owner for his/her record. This year, I've moved my list onto the digital domain of the Internet! Flyer clippings have now been replaced by hyperlinks (I'm too lazy to get images). I can modify it and it is instantly reflected on the list for my family a couple thousand kilometres away. You are probably asking yourself why I don't use a more web 2.0 thing like ThisNext. I think that's a great idea, but it has two problems for wish lists. First, somethings I don't know what exact product I want. For example, maybe I want a new pair of sunglasses, but I don't know exactly which pair, but ThisNext requires an exact product, or at least an example. Second, I would want to use ThisNext for all my shopping stuff, not just a seasonal thing. Plus, it would be a mix of things that could be gifts and things that I would want to get myself (so I get the right one). I would also have to remove things once I get them (like if I buy it myself), otherwise I could end up with duplicates. ThisNext is more of something that I would have for myself and I would know what I have and don't have and also what I don't like/want anymore. The hardest part about bible study is when you're told to flip to a particular passage in the bible. "Turn to Psalm 36, verse 6". Ok, first, what's a "Psalm" and second, where is it in the bible? "Second Corinthian, chapter 11, verse 9". I don't even know how to spell "Corinthian" to find it in the table of contents!!! I started reading the New Testament. It's actually very interesting to read. Things I've heard about previously make more sense now. I'm almost done the book of Mathew, which I'm told by the cheat notes in the edition of the bible I'm reading that it has been called "the most important book of Christendom-the most important book that has ever been written" by the French skeptic Renan. Too bad it's so poorly written! All the stories are disconnected, Matthew's thoughts are just all over the place, things are repeated like 50 times, and he's not particularly articulate. I was expecting more of a flowing story or something, but it's more like fragmented thoughts scribbled on a napkin. Step 1: Free trip to Seattle!!! I gotta go to Seattle, well, Redmond, to do interviews at Microsoft Research for the MSR Fellowship. Not sure when I'm going yet, but it has to be before mid-December. Scheduling is a bit of a pain with the CVPR deadline in there, plus volleyball playoffs, Nebojsa's skiing vacation, and NIPS. Correction: I'm already like #4 on Google. Made myself a rather tasty dinner tonight :). 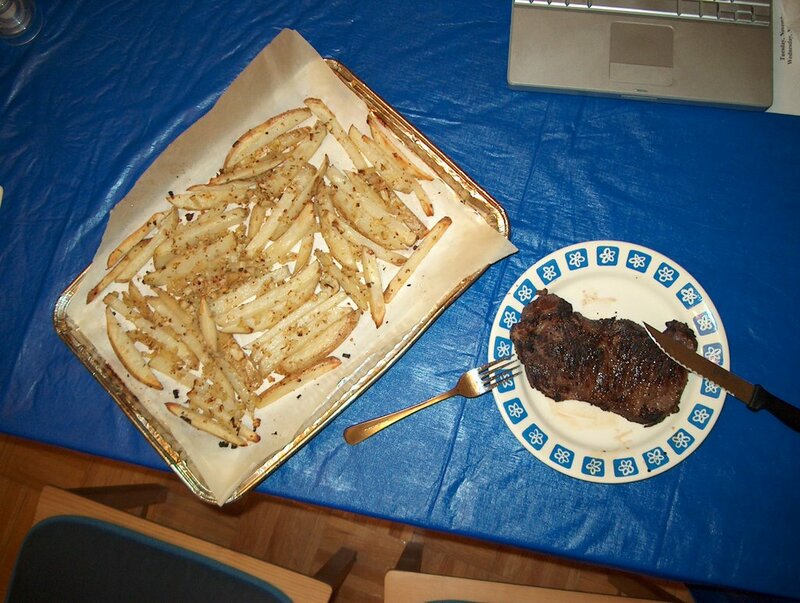 Red wine marinated steak (as suggested from this site telling me that everything I know about grilling is wrong) and fries made from scratch! I marinated the steak in Robert Mondavi red wine (it was on sale at the LCBO) and the Keg steak spice. It was the first time I marinated meat. It was definitely more tender, though it had a bit too much wine taste. Maybe I just marinated it too much (overnight). Next time I'll try something else, maybe a little sweeter as it was a little bitter this time from the wine. I actually felt my face getting a little red from the wine :s. I guess I did a good job of sealing the juices in :). For the fries, I cut up two potatoes, mixed in some chopped onions, oil, steak spice, olive oil, parsley flakes, red chili flakes, cajan spice, and probably some other random spices. Then, I laid it out on parchment paper, which is non-sticky, but absorbs and keeps too much moisture, and put it in the oven for like 30-40 min. I should probably use aluminum foil to make the fries crispier, but I get annoyed when it sticks, esp. with little bits of the foil sticks to the fries. 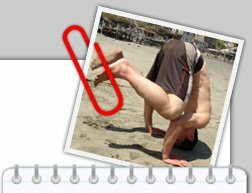 I was inspired by this page about exercising an open mind about a year ago. Since then I have been making an attempt to keep an open mind - do things I don't normally do, work outside my comfort zone, break the regular cycle of things. It's fun to add diversity to your life and in doing so you also meet new people. I'm making it a point to not outright discredit things that I know nothing about, and rather, learn more about it. Britton told us engineers way back in first year to expand our minds and not just do "engineering" things. He told us to visit art galleries, see the ballet, watch plays, go to the opera, etc. I have taken his advice. Davidson told us way back in AP English to read the bible. Not to try and convert us or anything, but to at least consider it as a literary work. There are so many biblical references in literature and popular culture, and I just don't get any of it. Plus, there are always Jeopardy categories related to the bible and I can't get any of those. Today, I made progress in religion, specifically Christianity. Elsa invited me to go to the University of Toronto Chinese Christian Fellowship (UTCCF) meeting. I had no idea what to expect. I have never gone to church for a sermon or whatever. The only times I have been inside a church have been for elementary choir, weddings/wedding receptions, high school convocation, and to play basketball. I've also been in a synagog for Kives's Bar Mitzvah. That's all the religious exposure I have had. My family is not religious, so I never went to church as a kid. So, today's meeting was mostly "worship". Worship of God through song (they had a band with people singing, a choir, and an acoustic set), dance, art (a guy from OCAD brought his thesis consisting of all the pages of the bible used as a painting canvas - it was pretty cool). There was also testimony and prayer. I was mostly observing today and seeing what it was all about. It kind of reminded me of this video where a guy went to Dearborn, Michigan (a mostly Muslim town) to be a Muslim for 30 days (a show created by the guy that did Supersize Me). It's a good watch. Initially, when he went into the Mosque with his host family, he was confused. The actions that the people were doing had significance to them and they were praying to their God, but without knowledge of Islam, he didn't understand it, was taken back by it, and could not bring himself to do it in fear of what the implications were with respect to his Christianity. Over the 30 days he learns more and becomes more accepting of the Islamic religion. Worship felt a little like that for me. I was actually rather amazed that people were allowing themselves to be so vulnerable and opening themselves up to "God". I enjoyed the music, I think Christian music generally has catchy tunes and the band was quite good. I remember sometimes tuning into the Christian radio station in Winnipeg for a change and liking the music (I didn't even know it was Christian music for the first little bit), I even downloaded some of the MP3s, though I don't attach religious significance to them. I like Christmas music, but I don't believe in Santa Claus. They had the lyrics on a projector today and I was carefully paying attention to the words, but didn't attribute meaning to them like the people that were literally exposing their souls. I'm so used to making sure that I do not make myself vulnerable and thinking that everything is in my own hands and it is up to no one but myself to make things happen. Prayer is awkward for me because of this. I'm not accustomed to asking for things, rather, I do them myself or make it happen. The only other experience I have in this is in school with The Lord's Prayer and saying grace before meals at John's house. I do see why people tend to turn to religion in times of turmoil. I can see the appeal of knowing that someone is there for you and looking out for you, and the hope that that gives you. I also see the appeal in the whole fellowship thing. Everyone's friendly and genuinely interested in meeting and knowing each other. It gives people a sense of community and that they belong. I definitely felt that today and it is something I am missing here in Toronto. After the meeting, most of the people went to Kowloon restaurant on Baldwin for food (it's their tradition) and we took over the entire restaurant. So, where does that leave me now? I don't know. I would like to read the bible and learn more, at minimum from an objective standpoint. Will I keep going to this fellowship thing? Not sure. I like the group setting and it would be nice to be a part of the group, but it feels kinda wrong if I go, but not believe. I still strongly believe in evolution and that is not going to change. Plus, come January, I won't be able to go anyways b/c of snowboarding :), well, unless I go straight from the bus in my snowboarding gear, do you think God would mind?